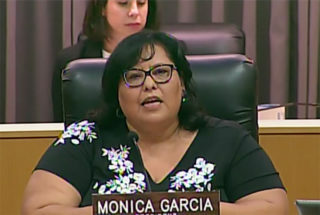 At Tuesday’s annual meeting of the LA Unified school board, Mónica García was elected to another term as president and a proposed parcel tax that would have generated $500 million a year for the cash-strapped district failed to garner enough support to make the November ballot. After a lengthy discussion — during which some board members voiced concern that district staff wasn’t prepared to campaign for the bond or to detail how the money would be spent — board members split 3 to 3 on the proposal, which needed a majority to pass. Board member Kelly Gonez, who gave birth to a boy over the weekend, was absent. While he didn’t cast a vote, Superintendent Austin Beutner said he preferred to hold off on the measure until 2020, when the district’s own polling showed it stands a better chance of passing. Polling results showed lukewarm support for a November vote on the measure, which the district would have had to pay roughly $6 million to support — money that would be lost to the district if the measure wasn’t successful. García signaled that the measure would likely resurface in future years once staff had the chance to conduct further research and better prepare for a ballot measure. LA Unified faces a budget deficit of $482 million by 2020, a shortfall the parcel tax was intended to fill. Some estimates show that within 13 years healthcare and pension obligations will eat up over 50 percent of the district’s budget. Board member George McKenna, who along with Scott Schmerelson brought the resolution, was concerned that the board was delaying the measure when it urgently needed funds. “This is not just a political issue, it’s a financial issue. We need money,” McKenna said. García, who was re-elected to another term as school board president with Schmerelson and McKenna voting no, appointed Nick Melvoin again as vice president. To pass, the parcel tax would have required a vote of 66 percent of voters, and polling conducted in February and June indicated it would likely fall short. 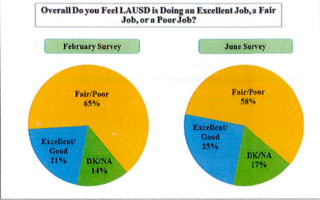 The polling also found that only a quarter of respondents thought the district was doing a good or excellent job. • Read the February and June polls here, and the highlights here. Also Tuesday, the board unanimously supported a resolution calling for an end to the separation of immigrant families at the border and to provide emotional and legal support to LA Unified children impacted by the policy. After a closed session meeting, the district announced that United Teachers Los Angeles had withdrawn its request for an impasse in contract negotiations. “We look forward to returning to the bargaining table, and working toward an agreement that respects the value and hard work of our employees and allows us to serve the needs of students,” Deputy Superintendent Vivian Ekchian said in a statement.